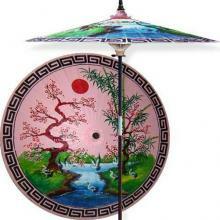 This colorful patio umbrella depicts the migration of Oriental cranes during the spring season. Each season represents a different part of life with spring being synonymous with rebirth. Great for any outdoor setting. 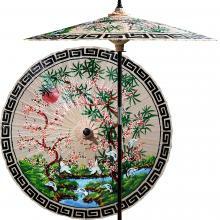 This colorful patio umbrella shows Asian cranes migrating across a verdant landscape. The bright green background reminds us of Spring, renewal and growth, and the subject matter itself is lively and vibrant. Many white Chinese cranes gather at a stunning blue stream beside blossoming pink and white cherry blossom trees while a red sun glows and completes the colorful pallet. You can establish a fun and joyful mood in your garden or on your deck with a colorful patio umbrella such as this one. Each patio umbrella is hand-painted and handcrafted in Thailand by professional artisans whose skill and expertise goes back generations. It takes a whole family of artists each with their own specialized skill to produce these colorful patio umbrellas, building them up from the natural materials of hardwood and bamboo, sewing the intricate spokes of the frame, soaking the cotton shade to render it water-resistant and finally hand painting the complete design--there is no machine printing or plastic parts are involved! Just old world materials, charm and craftsmanship make this patio umbrella the best choice for your outdoor space. My patio umbrella has just arrived. It is a beautiful sunny day here so I couldn't wait to get it unwrapped & assembled. The umbrella is absolutely fabulous the colours are vibrant and the quality is 1st class. I thought it would be different & artistic but this has by far outweighed my expectations. Thank you for all your help with my order, it was definitely worth the wait.